The Department of Planning and Permitting (DPP) for the City and County of Honolulu is currently revising the 2002 General Plan that has been guiding O‘ahu’s long-range objectives and policies. The General Plan addresses the critical issues of growth, development, and quality of life that island residents are most concerned about, including regional population, economic health, affordable housing, and sustainability. 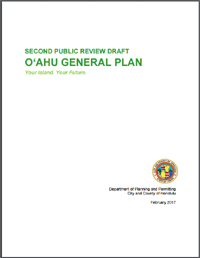 The O‘ahu General Plan covers 11 subject areas: Population, the Economy, Natural Environment and Resource Stewardship, Housing and Communities, Transportation and Utilities, Energy, Physical Development and Urban Design, Public Safety and Community Resilience, Health and Education, Culture and Recreation, and Government Operations and Fiscal Management. The objectives and policies are all based on the principle of sustainability in three key areas: environmental protection, economic health, and social equity. The first public review draft was published in November 2012, after background research and community input. The second public review draft was released in February 2017. I couldn’t make it to the public meeting on March 7, 2017 at McKinley High School. I didn’t have time to review the Oahu General Plan by the deadline to submit written testimony on May 8, 2017. I wish we had a just a little more time to submit comments, but I missed the deadline, so I thought I would share my comments here. Economy, Objective B, Deleted Policy 4: “Prohibit further growth in the permitted number of hotel and resort condominium units in Waikiki.” I believe this should remain a part of the General Plan. Waikiki is already at over-capacity, with overpowering hotels and condominiums, diminishing beaches, a lack of parking, and regular closures for parades and events. I think that further growth and expanded renovations are unsustainable. Housing and Communities, Objective A, Policy 1: “Support programs, policies, and strategies which will provide decent homes for local residents at the least possible cost.” I object to “the least possible cost” stipulation because quality materials and craftsmanship are not cheap. Housing and Communities, Objective A, Policy 12: “Promote higher-density, mixed use development, including transit oriented-development.” RELATED – Physical Development and Urban Design, Objective A, Policy 4: “Facilitate and encourage compact, higher-density development in urban areas designated for such uses.” I think that we need to add a stipulation that infrastructure, utilities, schools, and open spaces can support higher-density developments. By open spaces, we need to think both horizontally (parks and landscaping) and vertically (open sky). Health and Education, Objective B, Policy 1: “Support education programs that encourage the development of employable skills.” I think that public education has three broad goals: to get a job, to start a business, and to serve the community. To encourage entrepreneurship and innovation, this policy should be expanded to include self-employable skills and public service. Culture and Recreation, Objective A: “To foster the multiethnic culture of Hawai‘i and respect the host culture of the Native Hawaiian people.” and Policy 1: “Encourage the recognition of the Native Hawaiian host culture…” I think that the term “host culture” is divisive. If Native Hawaiians are hosts, then every immigrant and late-comer is a “guest,” invited or not, who may overstay their welcome. Government Operations and Fiscal Management, Objective B, (new) Policy 4: “Provide for remedies/penalties for mismanagement and gross negligence of government programs.” While there is a nod to accountability in Objective B, Policy 3, the policy lacks power. Government officials need to be held liable for their actions and inactions, beyond shuffling department heads or buying out contracts. Ironically, Government Operations and Fiscal Management has the fewest number of policies (just eight, even with two new policies added). What is your opinion of the revised O‘ahu General Plan draft? Which policies and objectives should be changed, added, or removed? There are so many ways to give back to the community, from fundraisers and clean-ups to volunteering, walking for charity, and cash donations. But few of us consider volunteering for as a board member. Maybe it seems like too much responsibility. Maybe we’re afraid to ask other people for donations. Maybe we think that we need to be wealthy or have a network of wealthy friends. Nonprofit boards need more than just money to be successful. They need people with passion, commitment, and a vision for how the nonprofit can continue. I’ve seen first-hand that if you can find a cause that you are passionate about and nonprofit board that is right for you, it’s a worthwhile commitment – not just for the nonprofit, but for you as well. I’ve been privileged to be part of small Hawaii nonprofit boards, as a member and as support staff, and I think that I am more confident in myself and feel more connected with the community. Build relationships with people who share your passion. Joining a board helps you meet new people from different backgrounds who you might never have met before, and work together on a common cause. You could get to know your neighbors, meeting other community advocates, and form lasting friendships with other board members. Gain leadership experience. By participating in board meetings and committees, you can help make decisions that will affect the organization. Your “day job” may not give you many opportunities to be a leader and shape the future of an organization. The decisions you make on a board can lead to increased confidence at work and during business negotiations. Learn more about a cause or industry that you are already passionate about. As a board member, you will have opportunities to learn about running efficient meetings, creating effective programs, dealing with legal issues, and approving budgets, as well as gaining inside-information about statistics, trends, challenges, and opportunities about your chosen cause. Your expertise can make you an even stronger and more convincing advocate for your cause. Share your skills. You may have “hidden strengths” that are unrelated to your current job or may have big ideas that don’t fit with your current job position, boss, or company. By volunteering for committees and programs, you have more opportunities to share your skills or explore new talents. Board experience can make a difference to the community and your career too. What causes are you passionate about? 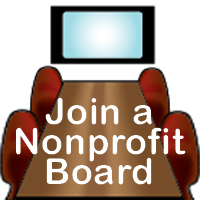 Have you ever volunteered as a board member? If yes, what has been your experience? If no, what would make you volunteer? Teachers give us so much, and their job is much harder than we realize. They prepare lesson plans that engage and inspire students. They find a balance between correcting mistakes and encouraging excellence. They stay after school for homework clubs and mentoring. They show up at school events in the evenings and on weekends. They make the classroom a safe place to learn, challenge assumptions, and build character. Today is National Teacher Day, part of a week-long event celebrating the teachers in our lives. You can say “Thank You” by joining the 2017 #ThankATeacher campaign and sharing stories and photos of special teachers. My son is completing the fifth grade this year, and I want to take a moment to thank my fifth grade teacher, Ms. Foster. She was energetic and fun and it was the year I started to see teachers as real people, outside of school. She set up a classroom economy with jobs, a bank, and even checkbooks. She gave us daily writing assignments to practice our writing skills and encourage creative writing. To this day, I remember the first verses of “Do your ears hang low?” and “I Can’t Do That Sum” that we had to recite. If you need some inspiration, the National PTA offers a free Teacher Toolkit to personally thank teachers for making a positive impact on your life and children’s lives. Which teachers had the biggest impact on your life? How will you thank a teacher today? Trading cards are what got me hooked on Marvel. I remember feverishly opening packs of Marvel cards, hoping for rare hologram cards, and once or twice splurging on a box so I could collect a complete set. I remember writing to Marvel to request an annual report, back when I didn’t have money to invest and Marvel wasn’t making a profit, and being amazed by its colorful, jaunty, comic book format. Lee was born Stanley Martin Lieber in New York City, New York on December 28, 1922 during the Great Depression. He spent most of his time reading – “I’d read the label on a bottle of ketchup if nothing else was around” and riding his bike – “It gave me freedom. I could go anywhere I wanted.” He gained self-confidence from his mother Celia and a strong work ethic from his father Jack, who was always looking for a better job. Proofread carefully. Pretend you’re the world’s toughest editor. “Amazing Fantastic Incredible” is an exciting, enthusiastic, and humorous memoir about a reader who went on to become a writer and an actor. Its graphic novel format kept me engaged. I love his creativity (he has conversations with his younger self), sly humor, humility (he credits artists Gil Kane, Jack Kirby, Larry Lieber, and Steve Ditko; acknowledges his family, wife Joan and daughter Joanie; and focuses on his fans), unwillingness to make personal attacks, and the respectful way he mentions personal tragedies and professional failures. 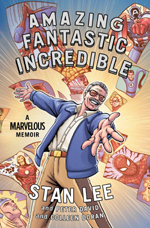 “Amazing Fantastic Incredible” is the most entertaining memoir I’ve ever read, and it left me wanting to know more about the next chapters in Lee’s – and Marvel’s – extraordinary adventure. Exciting! Electrifying! Calling all Star Wars fans, book and music lovers, and comic book readers! Be prepared for an amazing week. First, there’s… May the Fourth, aka Star Wars Day, a day to celebrate all things Star Wars. Dress up as your favorite Star Wars character. Stay up for a Star Wars movie marathon. Read your favorite Star Wars book (my 10-year old son’s recommendation: “Lost Stars” by Claudia Gray). Indulge in Vader taters, Wookie cookies, and Yoda soda. Practice your lightsaber moves. Followed by… Free Comic Book Day. From the nostalgic (Archie and Underdog) to the futuristic (Avatar and Dr. Who), for kids (SpongeBob) and kids of all ages, there’s a comic book for everyone! On Saturday, May 6, stop by a Hawaii public library and get a free comic book. Show your HSPLS library card at a Hawaii public library in Aiea, Aina Haina, Hawaii Kai, Hilo, Kahului, Kailua, Kailua-Kona (students, dress for the Cosplay competition! ), Kapolei, Kihei, Lahaina, Lanai, Liliha, Makawao, Manoa, McCully-Moiliili, Mililani, Princeville, Salt Lake-Moanalua, Waikiki-Kapahulu, Waimanalo, Wahiawa, Waimea (Thelma Parker Memorial), and Waipahu. Check with specific libraries for special activities. Wrapping up with… the Hawaii Book and Music Festival, May 6-7 in Honolulu. Immerse yourself in book readings, author signings, panel discussions, storytelling, music, hula, food demonstrations, and more. Trade your gently-used books at the Book Swap. Bring folding chairs or mats to sit on the lawn and soak up the entertainment. Let kids work off their energy in the Keiki Zone. A fun idea would be to have a round-robin storytelling, with a group of people pitching in to create an unexpected, one-of-a-kind story! What books, comic books, or graphic novels are you reading? Which historical, futuristic, or fictional world do you wish you could live in? You are currently browsing the Better Hawaii weblog archives for May 2017.